touristplacesinindia offers complete information on the city of Ooty, fast facts on Ooty, history of Ooty, best season to visit Ooty, climate and clothing in Ooty, Ooty hotels, places to see in Ooty, worth visiting places in Ooty, events and festivals of Ooty, accommodation options in Ooty, tourist attractions in Ooty, excursions form Ooty, hotels in Ooty, accessibility of Ooty, tour packages for Ooty, holiday offers for Ooty, how to reach Ooty through air, rail, road, luxury hotels and budget hotels in Ooty. Ooty is popularly known as the queen of hill stations. It is officially known as Udhagamandalam and is one of the most famous tourist destinations in Tamilnadu. With its scenic beauty and brilliant climate, Ooty forms a perfect summer getaway. Nestled in the lap of the Nilgiris, the hill resort presents excellent views of the mountain ranges. The Nilgiri range is a beautiful mountain range that is a part of the western ghat. It is older than the Himalayas. 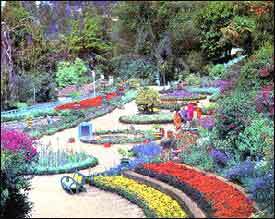 Ooty tourism forms a major part of tourism of the Nilgiri region. Ooty is famous for its tea. Lofty mountains, dense forest, expansive grasslands and miles of tea estates greet tourists almost everywhere in Ooty. The tea and tourism festival is one of the major tourist attractions in Ooty. Ooty has its origin dating back to 1817 during the British rule. The region is full of sky scrapping mountains and as you climb higher you actually travel through clouds lingering on the edge of the mountains. Traveling through the hair-pin bend roads is another experience altogether. Lakes, mountains, palaces, hills, water falls, gardens, you name it and you have it here. The place is an ideal tourist spot where you can loose yourself to fishing, loitering, sightseeing, playing golf and tennis. Some of the major tourist sites in Ooty are the Cairn hills, the Dodda Betta peak, the Tiger hills, the Arronmore Palace, the Awnandale palace, the botanical garden, the thread garden, the boat house lake, the Ketti Valley view, the rose garden, the Kandal cross shrine, the Kalhatty water falls, the Ooty museum and the Mudumalai wild life sanctuary. Ooty is easily accessible by railways. Trains connect Coimbatore with almost all the major cities in India. From Coimbatore you get Nilgiri mountain trains popularly known as toy trains, till Ooty. The hill resort is around 535 kilometers away from Chennai. Ooty has good road systems that connect it to the rest of the country. There are regular bus services from Bangalore, Tirupati, Mysore, Coimbatore and many other nearby places. The nearest airport is in Coimbatore. Being a major tourist spot, Ooty provides world class accommodation facilities. Hotels in the hill resort can be categorized into luxury hotels, budget hotels, resorts, lodges and inns. All major tour packages of Ooty include accommodation facilities. Touristplacesinindia.com offers you information on Ooty and many other tourist spots in India.